A beautiful Fruit Emotions gift set to give or receive as a present! 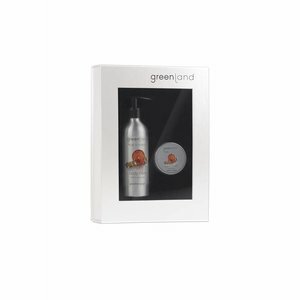 It contains a hand cream and a lovely moisturizing body lotion. Never have dry, raw hands again with the ultra-nurturing hand cream. Just emotions! Aqua (Water), Ethylhexyl Stearate, Glycerin, Isopropyl Palmitate, Butane, Polysorbate 20, Citrus Medica Limonum (Lemon) Peel Oil, Phenoxyethanol, Limonene*, Vanilla Planifolia Fruit Extract, Citrus Aurantifolia (Lime) Fruit Extract, Caprylyl Glycol, Propane, 1,2-Hexanediol, Acrylates/C10-30 Alkyl Acrylate Crosspolymer, Tetrasodium Glutamate Diacetate, Sodium Acrylate/Sodium Acryloyldimethyl Taurate Copolymer, Parfum (Fragrance), Propylene Glycol, Isohexadecane, Sodium Hydroxide, Citral, Polysorbate 80, Alcohol, Coumarin, Benzyl Benzoate, Potassium Sorbate, Sodium Benzoate, Citric Acid. 98% ingredients of natural origin.